The City in September 2016 was awarded a $26,409 TDEC energy grant to install a series of energy efficiencyprojects at three City facilities, creating significant taxpayer savings on municipal utilitycosts. The 50/50 matching grant funded half the cost of the projects up to $55,319. The City of Spring Hill’s energy project, completed in June 2017, was funded under a grant contract with the State of Tennessee and included reducing electrical and HVAC consumption at the Spring Hill Water Treatment Plant, City Hall, and the Public Library. The 50/50 matching grant funded the cost of the project up to $55,319.56, of which TDEC reimbursed 50 percent up to $26,409.78. Based on two years of utility bills, the three facilities use an average total of 2,064,180 kilowatt hours (kWh). The grant allowed the City to install indoor and outdoor LED lighting fixtures, energy-efficient HVAC components, and retrofits such as programmable thermostats and infrared wall switches that are expected to make the buildings 30-40 percent more efficient. The City anticipates reducing energy usage by 198,025 kWh, equaling $19,802.00 in annual savings. The estimated return on investment (ROI) for the cost of all three projects is less than three years, and the ROI for the City’s cost portion of this project is about 18 months. Funding for the projects comes from an April 2011 Clean Air Act settlement with the TVA. Under the Consent Decree, Tennessee received $26.4 million over the previous five years to fund clean energy mitigation programs in the state. TDEC has used the funding to reimburse grantees for a variety of innovative projects to reduce environmental impacts and operating costs at sites of new construction, redevelopment projects, and sites with aging infrastructure. The City of Spring Hill was one of only 13 government entities throughout the state to receive a share of more than $1 million in grant funds for energy efficiency projects announced­­ by Tennessee Gov. Bill Haslam and TDEC Commissioner Bob Martineau. Grant recipients implemented projects designed to reduce air emissions, improve energy efficiency and create cost savings. Specifically, the projects focused on cleaner alternative energy, energy conservation, and air quality improvement. “This year’s applicants have proposed creative energy efficiency programs designed to decrease emissions and reduce expenses at the local level. We will continue to look for ways to promote environmental awareness and energy efficiency within state government and in Tennessee communities,” TDEC Commissioner Martineau said in an August state news release about the grant program. 1.) Energy efficiency upgrades to City Hall include retrofitting the existing thermostats with seven-day, multi-time setting thermostats and replacing existing light switches with passive infrared occupancy sensors. The thermostats and sensors optimize conditions when occupants are present and reduce operating costs during non-work hours. The city also installed a single-room, ductless, split-system HVAC unit in the electronics room. 2.) 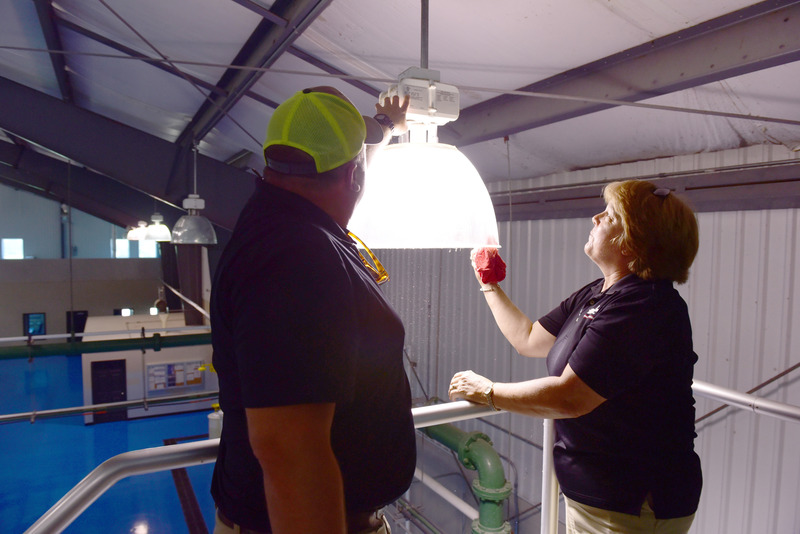 The Spring Hill Water Treatment Plant retrofitted 33 metal-halide, 400-watt ceiling fixtures with LED high bay lights. Since these lights operate 24-7, the upgrades not only will save energy, but will significantly reduce the need for constant maintenance. The old lights would generally last only 6-8 months, while the new lights will last 8-10 years. 3.) The Spring Hill Public Library installed an automated Energy Management System for HVAC efficiency improvements. The system monitors daily energy usage and HVAC operation and automatically reports any issues to designated personnel. Lighting in the library also was upgraded, replacing about a dozen 175-watt metal halide bulbs with 42-watt LED bulbs. Beyond reducing energy and operational expenses, the upgrades provide a better experience for library users. LED Lighting gives off a strong white light that provides better illumination than what is currently installed, enhancing public safety and city employee work areas, and improving security lighting. Programmable Thermostats provide instant savings that will continue through the life of the facility. Existing thermostats do not support set back temperatures or schedules to maximize savings. Passive IR Ceiling & Wall-Mounted Sensors decrease work time usage when personnel are not occupying areas, ensure all lighting is off during non-work hours, and extend the life of existing lights, reducing replacement cost and installation labor. - Existing lights are replaced every 6-8 months. The new lights will have an 8-10-year life span. - The estimated $200,000 savings over 10 years does not take into account additional savings in reduced maintenance and labor hours, or materials, such as not having to purchase bulbs annually. - Long lifespan LEDs reduce material waste to landfill and vehicle emissions.